Will You Make These Mistakes in Your Bankruptcy? John D’Amato Law Offices is a small law firm with over 20 years’ experience in helping individuals and small businesses with debt problems. By choice, John D’Amato is the sole attorney owner in this firm. Attorney D’Amato gives clients the choice to have him personally handle their case or to have it handled by an associate attorney under his close supervision. Rest assured, John and his staff will never look down upon a client. We understand there are many reasons for financial problems, including medical problems, loss of a job, and divorce. John will personally discuss with you what particular options are available. Daily, John sees his clients’ stress greatly decrease as they actively participate in selecting the best remedy. John enjoys practicing law and meeting the wide variety of individuals he sees daily. His clients include teachers, attorneys, laborers, doctors, collectors, and many others. John views his practice of law primarily as a profession and a calling, rather than a business. It is a means of earning a living by helping others.  [John D’Amato Law Offices] was recommended by two other attorneys. . . . I’m happy that I called. You explained everything so that I understood; you did not ‘look down’ at me. You made me feel comfortable and at ease. I am very pleased with your services. I have also recommended your services to someone because you explain so that anyone will understand. John was very good at giving the how and why about what Chapter to file. . . . Very good “wording” . . . John and legal assistant Margaret made [us] feel like part of the family. . . . No more stress . . . that meant a lot to the both of us. Thanks for your goodness to me . . . you’re a wonderful man. You and your staff were very comfortable to be with. I was very impressed with your knowledge of the bankruptcy system. Competitive fees — I didn’t call any other lawyer to get any of their fees. I felt confident with you from the first moment I talked to your secretary. I would and have recommended your services to anyone who would need them. Your services were very professional and personal.  We are a Debt Relief Agency and we help people file for bankruptcy under the Bankruptcy Code. Stock photographs do not depict actual attorneys or clients of John D'Amato, PLLC. The purpose of this website is only to provide general information and, thus, should not be interpreted as either formal legal advice or the forming of an attorney-client relationship. You should consult an attorney for individual advice regarding your own situation.